For her first exhibition with Tina Kim Gallery, Seoul-based artist Suki Seokyeong Kang has orchestrated a three-stage installation of sculpture, film and painting, offering a glimpse of her complex artistic practice prior to her US museum debut at the Institute of Contemporary Art in Philadelphia in late April. Here, she utilizes the gallery’s spacious sequential architecture to engage with the audience in a succinct narrative on cultural identity, memory, and art-making. The exhibition title Jeong 井 refers to a Korean musical notation system, Jeongganobo, that differs from the Western system of coding music in structure and form. Comprised of squares situated in a grid-like format, this musical system values time and suggests the next note through a lettering system in vertical sequence. Similar to notes that inform the musician through a score, Kang’s installation guides its audience through a set of visually subtle, yet conceptually robust steel and wood sculptures. The artist’s fascination with the grid system results in her use of the Chinese letter 井 for the exhibition title, due in part to its resemblance to this form. 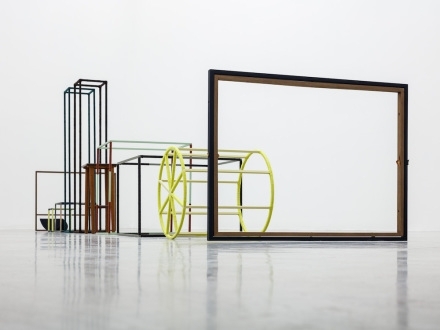 Occupying the first gallery space with a series of variously-sized hollow square sculptures in homage to Jeongganobo, Kang deconstructs and re-interprets not only the set structure of the Korean musical notation system, while questioning conventional methods of art-making. Each square corresponds with another size of canvas the artist paints on, challenging traditional divisions between genres and mediums. These industrial sculptures pose as ghostly towers, but also hint at utilitarian purposes with their thin frames and mute presence. Stripped from aesthetic or representational concerns, the notational sculptures convey poetic meditations on specificity and composure crucial in music making. Moras on the Black Mat, a sculpture composed of meticulously piled paintings Kang created over time, accompanies the grid sculptures, adding a colorful and “messy” accent to the otherwise neat installation.